In August 2012 the Neubauer family, of Chardon, purchased Sugar Pines Farm from Glenn & Carol Battles. Fritz and Jane along with their two sons, Fritz III and Sam, have operating the farm since then. Fritz and Jane were both born and raised in the Cleveland area and have been proud Geauga county residents for more than twenty years. Fritz is a “tree guy” by trade, operating a local tree service since 1986. He is also a Certified Arborist, which is coming in pretty handy with this new venture. Jane most recently operated a market research and consulting firm for twelve years, bringing some marketing, financial and general business skills to the table… make that, the barn. Fritz (III), 14, is an avid outdoorsman and already a natural at tree farming. He can operate every tractor and mower on the farm, helps with planting, cuts firewood, creates beautiful hand crafted wood-burned ornaments, and can usually be seen driving some sort of ATV around (probably too fast) during sales season, helping in any way he can. Sam, 10, continues to keep the “spirited” in holiday spirit. While he likes to help out around the farm he prefers the tree barn in its off season glory as a basketball court on the inside and baseball practice pitching wall on the outside. Always ready with a big smile, Sam’s favorite job on the farm is greeting customers when they pull down the driveway to get their trees. Watch for the little guy with the twinkle in his eye (and the horns on his head)! Sugar Pines Farm was started by Glenn and Carol Battles when they purchased the 100 acre farm in 1977. The land had not been used as a working farm for many years, until Glenn’s brother Ramon (owner of Tower-n-Pines farm down the street) introduced the idea of Christmas trees to him, showing him how to shear some of the white pines that had been planted for reforestation. 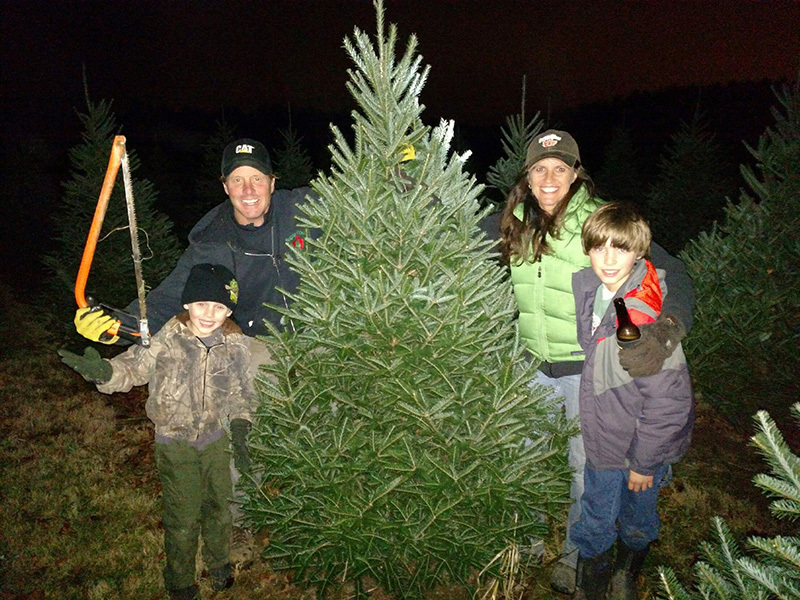 The Christmas tree idea took root and Glenn and Carol and their children began clearing and planting the fields that had been abandoned and neglected for 25 years. The crop has grown from an initial planting of 3,000 trees to about 25,000 trees spread across 30 acres today.